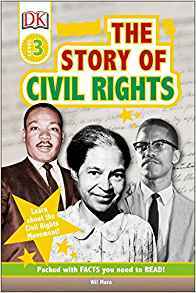 Including Rosa Parks and the Montgomery Bus Boycott, and Martin Luther King Jr. and the March on Washington, read the stories of the amazing men and women who fought for equality during the US Civil Rights Movement. Learn all about civil rights-what they are, and why they’re important. This book covers the history of civil rights in the US, including slavery and the abolition of slavery, and segregation. It discusses the momentous Civil Rights Movement, from sit-ins and protests, to marches and inspirational speeches, to legislation for equality. There’s also information about modern-day issues, and how children can use their voices to become activists in their own communities. Perfect for 7-9 year olds starting to read alone, Level 3 titles include in-depth information presented through more complex sentence structure with increasing amount of text to expand the reader’s general knowledge and confidence in reading. Additional information spreads are full of extra facts, developing the topics through a range of nonfiction presentation styles, such as quotes, lists, and statistics. Series Overview: Trusted by parents, teachers, and librarians, and loved by kids, DK’s leveled reading series is now revised and updated. With new jackets and brand-new nonfiction narrative content on the topics kids love, each book is written and reviewed by literacy experts and contains a glossary and index, making them the perfect choice for helping develop strong reading habits for kids ages 3-11. About the Author: Wil Mara is the award-winning novelist of the 2005 disaster thriller ‘Wave.’ His second book in the disaster group, The Gemini Virus,’ was released by Macmillan Publishing in October of 2012 to tremendous reviews by consumers and critics alike. In 2013, he released the first book in a new suspense series, ‘Frame 232,’ which features pivotal character Jason Hammond. ‘Frame 232’ begins with the discovery of new evidence concerning the Kennedy assassination. Wil has finished the second Jason Hammond novel, ‘The Nevada Testament,’ and is now developing the next story in the disaster series, ‘Fallout.’ More information about his work can be found at www.wilmara.com.